According to a news article from 26 January, the newly-formed island at Hunga Tonga-Hunga Ha'apai was about 120 m high, 1.5 km wide (N-S), and 2 km long (W-E). The island was an estimated 1 km in diameter with a crater that was 400-500 m in diameter. It had joined Hunga Ha’apai to the W and was 150-200 m short of joining Hunga Tonga to the N. The article noted that the eruption had decreased during the previous week; there were no longer emissions rising from the vent. A submarine eruption began here by 19 December 2014 and ended by 28 January 2015. 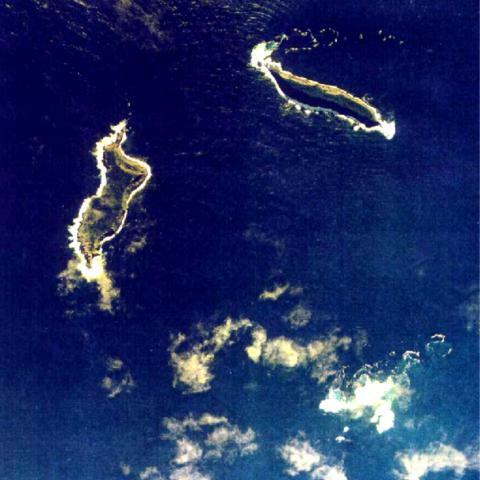 Hunga Tonga and Hunga Ha'apai are small islands situated on the rim of a submarine caldera known by the names of the two islands (Hunga Tonga and Hunga Ha'apai) (figure 12). The 2014-2015 surtseyan eruption added a circular area of land over 100 m in elevation at a spot S of and about midway along Hunga Ha'apai island's length. The new island initially grew as an isolated third new island, but subsequently connected and joined with Hunga Ha'apai. The area of new land surface eventually reached about 1.5 to 2 km in diameter. The new island also grew to come as close a few hundred meters from Hunga Tonga island. The eruption issued dense ash plumes that generally rose less than about a kilometer in altitude but preliminary estimates on the associated higher, ash poor steam plumes rose to 7-10 km altitude. Figure 12. (Inset) A map showing a large scale view of the South Pacific with the Kingdom of Tonga highlighted in purple. (Main map) Hunga Tonga and Hunga Ha'apai lie on the rim of a submarine caldera located 65 km N of a wharf in the harbor at Nuku'alofa, Tongatapu island (the main island of the archipelago). Nuku'alofa is a deep-water port, the nation's capital, and Tonga's economic hub. Tongatapu island also hosts an international airport, which sits to the S of the capital. (The word "Ha'apai" is also used as the name of a region of islands and reefs well N of Hunga Tonga-Hunga Ha'apai.) The volcano also lies ~70 km SW of Normuka island. Courtesy of USGS. This 2014-2015 eruption followed 5 years of quiescence, the previous eruption having occurred in 2009 (BGVN 34:03). That 2009 eruption formed new land above water and deposits destroyed vegetation on neighboring Hunga Tonga and Hunga Ha'apai islands (BGVN 34:03). The 2009 eruption added land at the S end of Hunga Ha'apai island. New research has been published discussing the 2009 eruption since our earlier report (BGVN 34:03). For example, Allen and Riebeek (2009) issued a 28 March 2009 Earth Observatory picture of the day that featured Hunga Tonga-Hunga Ha'apai images depicting the island morphology before and after the eruption. For another example, Vaughan and Webley (2010) discussed satellite observations associated with the 2009 eruption. Bohnenstiehl and others (2013) also discussed marine acoustic signatures from the 2009 eruption. A key source used to create this report on the 2014-2015 eruption consists of four reports created by the Tongan Ministry of Information and Communications (MIC) and released during 14-28 January 2015. Those four MIC Advisories (numbers 3, 4, 5, and 6) are hereafter referred to as MIC (2015 a, b, c, and d). MIC 3 (2015a) was issued 14 January looking back in time at key aspects of the eruption. Discussions included the location and behavior of the first seen early observations on 20 December 2014, a site visit by the Tongan Navy on 6 January, and a pilot report on 13 January 2015. MIC 4 (2015b) was issued on 19 January describing a visit made on 14 January. This was the first report of the existence of a new island. By this time the new island had attached to Hunga Ha'apai island, roughly doubling the size of that island. MIC 5 (2015c) was also issued on 19 January. It described observations made from a visit aboard a ship (the VOEA Neiafu) on 17 January. MIC 6 (2015b) issued on 28 January describing for a visit on 24 January 2015. The report noted a lack of ash, gas, or steam coming from the vent that formed the new island. The authors concluded that the eruption "appears to be over." They provided a sketch map of the new island. There were no new MIC reports during February-March 2015. The visits and reporting drew on support that included the Tonga Meteorological Services, NZ-Meteorological Services, the Tongan Navy, National Emergency Management Office, Tonga Broadcasting Commission, the New Zealand High Commission, and Ministry of Lands and Natural Resources, Tonga Airport Limited, Tonga Meteorological Services, GNS-NZ, NZ-Meteorological Services, and possibly others. Eruption, December 2014. The online newspaper Matangi Tonga on 30 December noted that fishermen observed an eruption near Hunga Tonga-Hunga Ha'apai on 19 December 2014 (Matangi Tonga, 2014). An editor from that publication, Mary Lyn Fonua, notified GVP of the eruption. The same publication issued over 10 reports during 30 December 2014 through at least 9 March 2015 (Matangi Tonga, 2014, 2015a, b, c). MIC (2015a) was released at 0943 on 14 January; it reported the position of the vent that was active on 20 December. Figure 13 is a later version of their figure, made at higher resolution. MIC (2015a) described this particular area as venting steam and sulfurous-gas at the sea surface. Emissions here did not persist during the later stages of the eruption. Figure 13. A map (N to top) showing the location of steaming at Hunga Tonga-Hunga Ha'apai volcano (orange icon) on 20 December 2014. Each of the two islands are about 2 km long and lie on margins or rim of the mostly submarine caldera, with Hunga Tonga island to the N, and Hunga Ha'apai island to the W of the caldera's center. The area circled in red is the approximate location of the vent that later formed a new rapidly growing island. Taken from Culture Volcan (2015). Klemetti (2014) showed an image from a MODIS instrument aboard the Aqua satellite that captured of the area of the eruption on 29 December 2014 (figure 14). A small white plume was in evidence at the volcano in the image. He commented that the area of discolored water stretching to the S could be due to the eruption. Figure 14. The eruption plume from Hunga Tonga-Hung Ha'apai seen on 29 December 2014 by Aqua's MODIS Imager. Image by NASA with annotations by Erik Klemetti (Klemetti, 2014). According to Metangi Tonga (2014) on 30 December 2014, "A continuing eruption from Tonga's active undersea volcano, Hunga Ha'apai, was clearly visible on the horizon northwest of Tongatapu today." Activity during January 2015. During the 6 January visit (MIC, 2015a), observers nearing the volcano saw vigorous venting at a new location. MIC (2015a) did not disclose whether a new island had yet emerged but later reporting mentioned below did clearly document an island. The sea (or perhaps a very low island) discharged vigorous emissions of black ash and white billowing clouds. The new location was situated farther N, much closer to the preexisting islands, than the vent indicated in figure 13. That submarine vent to the S lacked further indications of steam emission during the course of the eruption. Neither of the preexisting islands appeared to contain active vents. MIC (2015a) contained 11 captioned photos, but most are somewhat hazy and with limited contrast, conditions explained later (MIC, 2015b) as due to rain. Plumes on the 6th rose up to 2 km, but almost all the plumes in the photos were under 1.3 km altitude. At least one photo appeared to capture two low, vertical and parallel plumes. The photos documented some highly non-vertical black plumes, some peculiar low white plumes that seem to rise suddenly at distance, black plumes that appear to contain abundant clasts in their leading edge, low billowing clouds that encircle the darker ones and hug the water surface. In one case (figure 9 of MIC, 2015a) they reported that a white plume with its basal portion hugging the sea surface extended E over 3 km. The captions to their figures 10 and 11 indicated pulsing phenomena..
On 12 January 2015, Wellington VAAC reported ash from Hunga Tonga-Hunga Ha'apai reached an altitude of 6 km. They reported that fallout from the plume turned the sea surface red. Brief discussion of red colored sea surface is again mentioned below, both associated with observations on 14 January 2015 and briefly in a quote in an article by Field (2015). The Wellington VAAC issued graphics to illustrate observed plume location and possible plume dispersal (figures 15 and 16). On figure 15 they labeled the altitude of the plume as SFC/FL200 (20,000 feet, ~6 km). The label "10/0500Z OBS" refers to the coordinated universal time (UTC) when the plume was observed. The next three cartoons represent movement of the ash plume at 6-hour intervals. The VAA graphic in figure 16 is based on the ash advisory mapping shows the recommended area of avoidance and several flight routes in the area. Figure 15. Wellington VAAC Ash Advisory maps produced to describe the Hunga Tonga-Hunga Ha'apai plume and its trajectory. Times and dates are UTC (e.g., "10/0500Z" corresponds to 10 January 2015 at 0500 UTC). (Upper left) This is the observed ("OBS") ash plume's margin, which was traced onto this map from satellite image. This is the starting point for the subsequent forecasts. (Upper right) The forecast ("FCST") plume after 6 hours. (Lower left) The forecast plume after 12 hours. (Lower right) The forecast plume after 18 hours. Courtesy of the Wellington VAAC. [Maps extracted from NZ Met Service website (OBS-Observed; FCST, Forecasted) (http://vaac.metservice.com/vag/243040-2015_19)]. Figure 16.Wellington VAAC graphic showing the Hunga Tonga-Hunga Ha'apai ash plume boundararies for 12-13 January 2015 as an area enclosed in a blue polygon. The curved black lines in the center and at right are flight paths. Taken from the Wellington VAAC graphic for 12-13 January 2015. MIC (2015a) noted that all international flights on 13 January 2015 were cancelled, though the domestic airline was operational. A Tongan government daily media release on 13 January described the ongoing eruption and cancellation of flights: "Activity continues at the Hunga Ha'apai-Hunga Tonga region and the emission of ash is reported to have escalated. Volcanic ash is forecasted to reach 870 km in 80 km wide toward the ESE from the Hunga Ha'apai-Hunga Tonga Region. By 11 January 2015, Real Tonga Airlines cancelled their flights for the day." Similar discussions of flight cancellation occurred around this time in Matangi Tonga, in their reports for 9, 13, 14 January. On 13 January 2015 the Australian Aviation blog reported numerous flight cancellations, including Air New Zealand, Fiji Airways, and Virgin Australia. They also reported resumed service on 14 January 2015. According to Matangi Tonga (2015a) flights resumed on 15 January. MIC (2015b, one of two reports issued on 19 January) discussed a site inspection on 14 January using a Tongan Navy vessel. The 14 January observations conveyed in MIC (2015b) noted that continuous volcanic eruptions had created a new island (figure 17). On 14 January the volcano was erupting about every five minutes. Ash and rock were ejected to a height of about 400 m above the sea surface. Wet ash was deposited close to the vent, building up the new island. Hazardous surges of ash and steam spread out horizontally during eruptions, and extended more than 1 km from the erupting vent (figure 18). Ash and acid rain fell in an area of ~10 km surrounding the eruption. Figure 17. Sketch map of Hunga Tonga-Tonga Ha'apai as seen during a 14 January 2015 site inspection. The arrow points to the initial vent seen on 20 December 2014. The red circle indicates the location of the later vent that erupted for about a month, constructing an island with above water extent on 14 January 2015 in the area within the yellow circle. The circle is roughly 2 km in longest dimension. On the basis of this map, the minimum distance between Hunga Tonga island and the new land scales to ~300 m. Modofied from MIC (2015b). Figure 18. The new island amid eruption on 14 January 2015. The view is looking NE and the steep high area is Hunga Ha'apai island, which resides in behind the new island. The plume was made up of discrete white and dark components. From this perspective the vent appears to sit in the midst of the new low island. Photo taken on 14 January 2015 from the Tongan naval vessel ~300 m offshore (MIC, 2015b). MIC (2015b) noted that on 14 January steam rose over 1 km and was noted by pilots. The eruption continued to emit ash but in recent days the presence of ash has been limited to low elevations. An early summary section in the report also include the following. "The new island is more than 1 km wide, ~2 km long and about 100 m high. During our observations the volcano was erupting about every 5 minutes. Dense ash was being erupted to a height of about 400 m, accompanied by some large rocks. Higher we observed mostly steam, but with some ash. Above about 1000 m, the eruption plume was almost exclusively steam. As the ash is very wet, most is being deposited close to the vent, building up the new island. "Hazardous surges of ash and steam were seen to spread out horizontally during eruptions, and these extended more than 1 km from the erupting vent. "Ash fall and acidic rain was observed within 10 km of the eruption. Leaves on trees on Hunga Tonga and Hunga Ha'apai have died, probably caused by volcanic ash and gases. "No large rafts of pumice or other floating volcanic debris were observed. Strong smells of volcanic gases were noticed on a few occasions. "This eruption is similar to that at Hunga Ha'apai in 2009, but only producing larger volume of materials resulting in the size of the island. "It is unclear at this stage if there is any relationship between the eruption and a red algal bloom observed in seawaters around Tonga recently." Field (2015) contained an image from the 14 January site inspection (figure 19). Figure 19. Hunga Tonga-Hunga Ha'apai eruption viewed from a Tongan naval vessel N of the island on 14 January 2015. Taken from Field (2015) with photo credit there given to the New Zealand High Commission in Tonga. On 14 January Matangi Tonga (2015b) reported more details on the algal bloom mentioned above (the cause of which remains uncertain). Matangi Tonga (2015b) also reported unusual optical effects seen on the E facing side at the NE end of Tongatapu island (Kanokupolu beach) around that time. The article said the bloom "...turned the seas frothy white, chocolate and red..." and "...the sun shone through a champagne sky." The article contained photos by Shane Egan documenting these effects. Algal blooms can in some cases be detected and tracked by remote sensing as exemplified by Mantas and others (2011), who discuss remote sensing of algal communities as a possible cause of discolored water associated with the Home Reef eruption of 2006. MIC (2015c) discussed a site visit conducted aboard a naval vessel on 17 January 2015. The authors noted that the eruption still continued at the new island during the visit. MIC (2015c) further stated the following. "During most of our time near the island, strong emission of steam to heights of 7–10 km was observed, but with only limited amounts of ash. Later, some eruptions that threw dense, wet ash, and small rocks 200-300 m into the air, accompanied by further strong emissions of steam. Hunga Tonga and Hunga Ha'apai islands were covered by ash from the eruption over the last month. The eruptions observed today were too small to deposit ash on those islands, suggesting that the eruptions a week or two ago were probably substantially stronger than those observed [on the 17 January site visit]. No trace of rafts of pumice or other floating volcanic debris was observed. No strong smells of volcanic gases were noticed within 3.7 km of the site, it was noticed however 27-47 km on the way to the site. The style of this eruption is similar to that at Hunga Ha'apai in 2009, but the volume of material erupted this time is much greater. International and domestic flights have operated without interruption in the last few days." On 19 January 2015, the Pléiades satellite captured the Hunga Tonga-Hunga Ha'apai eruption. France's Centre National d'Etudes Spatiales (CNES) issued the resulting 50 m resolution images of the new land created by Hunga Tonga-Hunga Ha'apai's latest eruptions (figure 20). Hunga Tonga island in on the upper right; and Hunga Ha'apai, center left. In the center of the image is a nearly circular, gray colored area, which is the newly created land attached to Hunga Ha'apai island. The vent area on the new island was filled with water (green). Ash from the eruption covered extensive areas of the vegetation on both islands. This and other Images were featured in the article Airbus Defense and Space (2015). Figure 20. CNES Pléiades satellite image (50-m resolution, optical band) taken on 19 January 2015. Ejecta from the new crater connects it to the E side of Hunga Ha'apai (island at left). Taken Airbus Defense and Space (2015) with data acquisition credit to CNES. MIC (2015d) was issued on 28 January 2015 summarizing a 24 January site visit, which found the eruption over by this time. Figure 21 shows where the new land surface joins the preexisting Hunga Ha'apai island. Rough seas prevented landing and limited the trip to observations from the naval vessel. The scientists stated, "The eruption from the new island that started growing over a month ago appears to be over. There were no sign of any emissions of ash, gas or steam observed coming out from the vent of the newly formed island." Figure 21. The point where new land adjoins the older island as seen in January 2015 after the Hunga Tonga Hunga Ha'apai eruption was over. The steep sea cliff forming the old margin of Hunga Ha'apai island is on the left. In the center and right parts of the image lie a low area of gently sloping gray material, which is an outer portion of the newly created land. Besides creating the new land, ash from the eruption covered vegetation over extensive areas on both the older islands. Taken from MIC (2015d). On 13 March 2015, Luntz (2015) reported that on 6 March 2015 GP Orbassano and two other residents of Tonga landed on one of the new land's three beaches. With his son, he climbed to the highest point of the island's crater, which was ~250 m high. According to Luntz (2015), Tonga's lands and Natural Resources Ministry said the newly formed island was 1.3 km long and 800 m wide. Orbasano smelled sulfurous and other chemical odors. The vent had filled with opaque green water (figure 22). Matangi Tonga (2015c) also reported on this same topic and featured numerous photos. Figure 22. The crater lake in the vent area located in the central area of new land as seen on 6 March 2015. Courtesy of Luntz (2015) with photo credit to GP Orbassano. Luntz (2015) quoted Orbassano as saying "the ash and rock surface was difficult to walk on due to the channels cut in it" (figure 23). Figure 23. The highest peak on the new land as seen as seen on 6 March 2015. Note extensive rills and gullies. Taken from Luntz (2015) with photo credit to GP Orbassano. "There are thousands of seabirds--all kinds, laying eggs on the island," Orbassano said (figure 24). Figure 24. On the new land surface at Hunga Tonga-Hunga Ha'apai, these sea bird eggs were found laid directly upon the fragmental deposits. Taken on 6 March 2015. Courtesy of Iflscience and GP Orbassano. Bohnenstiehl D.R., Dziak R.P., Matsumoto H., Lau T.K. Underwater acoustic records from the March 2009 eruption of Hunga Ha'apai–Hunga Tonga volcano in the Kingdom of Tonga. J. Volc. Geotherm. Res. 2013;249:12-24. Field, M, 2015, Tonga volcanic eruption creates new island, Stuff.co, posted 16 January 2015 (URL: http://www.stuff.co.nz/world/south-pacific/65103454/tonga-volcanic-eruption-creates-new-island ). Klemetti, E, 2014, New Eruption at Hunga Tonga-Hunga Ha'apai, Wired (online), posted 30 December 2014 (accessed 6 June 2015). Luntz, S, 2015, Newly emerged Pacific "Island" photographed for the first time, IFLSCIENCE (posted 13 March 2015. Accessed March 2015 (URL: http://www.iflscience.com/physics/newly-emerged-pacific-peak-photographed-first-time). Mantas, V M, Pereira, AJSC., and Morais, PV, 2011, Plumes of discolored water of volcanic origin and possible implications for algal communities. The case of the Home Reef eruption of 2006 (Tonga, Southwest Pacific Ocean). Remote Sensing of Environment, v. 115, no. 6, p. 1341-1352. Matangi Tonga, 2014, Hunga Ha'apai eruption continues, Matangi Tonga (Posted 30 December 2014; free content accessed in May 2015) (URL: http://matangitonga.to/2014/12/30/hunga-haapai-eruption-continues). Matangi Tonga, 2015a, Fua'amotu airport's busiest day, as flights resume, Matangi Tonga (Posted 15 January 2015; free content accessed in May 2015) (URL: https://matangitonga.to/2015/01/15/fuaamotu-airports-busiest-day-flights-resume). Matangi Tonga, 2015b, Nature plays with the sea and sky in Tonga, Matangi Tonga (Posted 15 January; free content accessed in May 2015) (URL: http://matangitonga.to/2015/01/15/nature-plays-sea-and-sky-tonga). Matangi Tonga, 2015c, New volcanic island attracts sightseers, Matangi Tonga (Posted 9 March 2015; free content accessed in May 2015) (URL: http://matangitonga.to/2015/03/09/new-volcanic-island-attracts-sightseers). MIC, 2015a, Government of Tonga Ministry of Information and Communication 3 (issued 14 January 2015) (URL: http://www.mic.gov.to/news-today/press-releases/5180-advisory-of-volcanic-activity-no3) (Accessed April 2015). MIC, 2015b, Government of Tonga Ministry of Information and Communication 4 (issued 19 January 2015) (URL: http://www.mic.gov.to/news-today/press-releases/5185-volcanic-advisory-4) (Accessed April 2015). MIC, 2015c, Government of Tonga Ministry of Information and Communication 5 (issued 19 January 2015) URL: http://www.mic.gov.to/news-today/press-releases/5183-volcanic-advisory-5) (Accessed April 2015). MIC, 2015d, Government of Tonga Ministry of Information and Communication 6 (issued 28 January 2015) (URL: http://www.mic.gov.to/news-today/press-releases/5197-volcanic-advisory-6) (Accessed April 2015). Vaughan, RG, Webley, P, 2010, Satellite observations of a surtseyan eruption: Hunga Ha'apai, Tonga, Journal of Volcanology and Geothermal Research. 12/2010; 198(1-2):177-186. DOI: 10.1016/j.jvolgeores.2010.08.017. Information Contacts: Tonga’s Ministry of Information and Communications (URL: http://www.mic.gov.to); Tonga’s Natural Resources Division of the Ministry of Lands and Natural Resources (URL: http://www.mic.gov.to/ministrydepartment/14-govt-ministries/lands-survey-nat-res/); Mary Lyn Fonua, Matangi Tonga online (URL: http://matangitonga.to/); NASA Earth Observatory (URL: http://earthobservatory.nasa.gov/); Wellington Volcanic Ash Advisory Centre, NZ Meteorology Service (URL: http://vaac.metservice.com/); Tonga Meteorological and Coastal Radio service (URL: http://www.met.gov.to); GNS Science (formerly New Zealand’s Institute of Geological and Nuclear Sciences Limited), Taupo, New Zealand (URL: http://www.gns.cri.nz/); and GP (Gianpiero(?)) Orbassano, Waterfront Lodge, Vuna Road, Ma'ufanga, PO Box 1001, Nuku'alofa, Tonga (URL: http://www.waterfront-lodge.com/). Based on a news article some international and domestic flights in Tonga had been canceled during 12-13 January, affecting about 600 passengers, due to the ash cloud produced from the on-going eruption at Hunga Tonga-Hunga Ha'apai. The article noted that ash plumes were rising to an altitude of 9 km (29,500 ft) a.s.l. from a larger explosion and that water around the eruption was colored blood-red. In a video of the eruption, posted on 18 January, volcanologists observe and describe the explosions occurring from a vent on a new rapidly-growing island. Based on a pilot observation, the Wellington VAAC reported that a dark ash plume from Hunga Tonga-Hunga Ha'apai rose to an altitude of 4.9 km (16,000 ft) a.s.l. on 12 January. Based on a pilot observation, the Wellington VAAC reported that an ash plume from Hunga Tonga-Hunga Ha'apai rose to an altitude of 3 km (10,000 ft) a.s.l. on 6 January. According to a news article, fisherman had reported an eruption at Hunga Tonga-Hunga Ha'apai on 19 December. A photographer in Tongatapu captured a photo of a steam plume rising from the area on 30 December and noted that steam plumes had been visible since 24 December; dense clouds on the horizon prevented views before then. Terra MODIS imagery from 29 December also showed white plumes and areas of discolored water near the islands. Based on information from Tonga Meteorological Services, analysis of satellite imagery, and pilot observations, the Wellington VAAC reported that during 18-19 March ash plumes from Hunga Tonga-Hunga Ha'apai rose to altitudes of 4-5.2 km (13,000-17,000 ft) a.s.l. and drifted NE and about 480 km ENE. On 20 March, steam plumes rose to an altitude of 1.8 km (6,000 ft) a.s.l. Wide-spread haze was reported in areas downwind, below an altitude of 1.5 km (5,000 ft) a.s.l., including in Vava'u, a group of islands about 255 km NE of Hunga Tonga-Hunga Ha'apai. On 21 March, an eruption plume rose to an altitude of 0.8 km (2,500 ft) a.s.l. According to news articles, the eruption started on 16 March from two vents, one on Hunga Ha'apai and another about 100 m offshore. Video footage and photographs taken from a nearby boat and posted on 20 March showed repeated dark, ash-rich Surtseyan explosions and associated base surges from two vents. A journalist that visited the area reported that the island was covered with black ash, and coconut trees were reduced to black stumps. Dead birds and fish were seen in the water. Observers flying near the area of Hunga Tonga-Hunga Ha'apai (about 62 km NNW of Nuku'alofa, the capital of Tonga) on 16 or 17 March reported seeing an eruption. Photos showed an eruption plume with a wide base that rose from the sea surface and mixed with meteorological clouds. Based on information from the Tonga airport and analysis of satellite imagery, the Wellington VAAC reported that on 18 March, a plume rose to altitudes of 4.6-7.6 km (15,000-25,000 ft) a.s.l. and drifted NE. Fishermen reported the beginning of an eruption E of Hunga Ha'apai Island on 1 June at 0800. They noted the ejection of "fire," tephra, and large volumes of dense white smoke/steam. Sea water nearby was warm. The next day, a Friendly Islands Airways pilot reported an active eruption at the S edge of a shoal. Vigorous steam emission was occasionally punctuated by ejection of solid material. On 3 June at 0915, a Friendly Islands flight with geologists Saimone Helu (Ministry of Lands, Tonga), Julian Pearce, and Michelle Ernewein (Newcastle Univ) was diverted to view the eruption. The eruption was continuing in shallow water ~1 km SSE of Hunga Ha'apai. Lava had apparently been erupted from three sources in a SW-NE trend extending 100-200 m, with current activity at the SW end. There was no evidence of a new island. Information Contacts: R. Gatliff, S. Helu, and S. Tongilava, Ministry of Lands, Survey, and Natural Resources, Tonga; R. Singh, Mineral Resources Dept, Suva, Fiji. A new eruption from multiple vents on and near Hunga Ha'apai Island began producing ash and steam plumes sometime in the late afternoon of 17 March 2009. The early stage of the eruption was photographed by Steven Gates (figures 1 and 2) at 1804 on 17 March while flying from Vava'u to Tongatapu. Coordinates provided by the Chathams Pacific pilots accurately located the activity as being near the islands of Hunga Tonga and Hunga Ha'apai, about 55 km NNW of Tongatapu Island, where the capital, Nuku'alofa, is located. The pilots had not observed any activity on the way to Vava'u approximately 90 minutes earlier, nor did pilots on previous flights that morning. Figure 1. Aerial photograph showing the eruption plume from Hunga Ha'apai island at 1804 on 17 March 2009. The island of Hunga Tonga is the dark linear feature at lower right. Courtesy of Steven Gates. Figure 2. Closeup aerial photograph of the Hunga Ha'apai eruption at 1804 on 17 March 2009. Horizontal plumes on the ocean, tephra fallout, and discolored water can be seen. Courtesy of Steven Gates. According to Matongi Tonga news, the Tonga Defence Services reported the eruption to the Geological Division of the Ministry of Lands on 17 March. Government geologist Kelepi Mafi noted that "sharp tremors" had been recorded by their seismic instruments during the previous three weeks, though the seismicity could not be directly linked to the eruption. Quotes by Mafi indicated that, based on seismicity, the submarine eruption may have started on 16 March. However, initial reports of steam plumes seen on that day were incorrect, as were reports of the eruption being 10 km SW on Tongatapu. As reported by Agence France Presse (AFP), radio journalist George Lavaka viewed the eruption from a game-fishing boat operated by Lothar Slabon on the afternoon of 18 March. He described an island completely covered in black ash, coconut tree stumps, and dead birds and fish in the surrounding water. Video and photographs taken by passengers on that boat clearly showed a submarine vent offshore to the S and another vent some distance away on the NW part of the island (figure 3). Activity increased during the hour that the boat was present, during which time both vents exhibited strong Surtseyan explosions (figure 4), an eruption type named for Surtsey volcano off the coast of Iceland. As the eruption from the offshore vent became stronger, the plume included larger amounts of steam, produced base surges along the ocean surface, and ejected bombs (figure 5). Fortunately the boat left the area just as the eruption escalated and volcanic bombs began falling around them. Figure 3. Photograph of a steam-and-ash plume rising from Hunga Ha'apai Island and a submarine vent to the S erupting black tephra. View is looking NW on 18 March 2009. Photo from unknown photographer on the Sloban boat provided by Dana Stephenson/Getty Images on boston.com. Figure 4. Photograph showing dark ash-laden Surtseyan eruption plumes from both Hunga Ha'apai vents. View is looking NNE on 18 March 2009. Photo from unknown photographer on the Sloban boat provided by Dana Stephenson/Getty Images on boston.com. Figure 5. Photograph of the offshore Hunga Ha'apai vent during a strong eruptive event on 18 March 2009. Bombs with trailing ash plumes can be seen falling from the eruption cloud, which is producing base surges along the ocean surface. Photo from unknown photographer on the Sloban boat provided by Dana Stephenson/Getty Images on boston.com. A science team led by Mafi observed the eruption site at Hunga Ha'apai from a boat on 19 March. By that time, as reported by AFP, tephra had filled the gap between the submarine vent, originally about 100 m offshore, and the island, adding hundreds of square meters of land. Residents on Tongatapu reported orange glow from the eruption on the night of 19 March. Aviation reports. A New Zealand Dominion Post article on 19 March noted that flights were disrupted and rerouted around the activity following warnings from Airways New Zealand and MetService NZ. The Wellington VAAC issued an aviation notice on 18 March based on ground observations from the Tongatapu airport of a plume rising to an altitude of 7.6 km at 0659 that morning; ash was not seen in satellite data. Later that day, at 1330, a plume seen on MODIS satellite imagery was within 1 km of the vent and moving NE. A similar plume was reported based on MODIS and ground observations to an altitude of 4.5 km at 1600. Airport observers continued to report a plume to 5 km altitude at 1000 on 19 March, and to 4 km at 1700, but with a band of ash extending 2.5 km NE from the volcano to 2.4 km altitude. D. Tait, a pilot for Air Chatham, noted that at 1700 on 19 March frequent eruptions were ejecting black ash, sometimes to a height of 300 m. The main white eruption plume was rising to about 4 km altitude and drifting ENE, to a distance of almost 500 km as seen in MODIS satellite imagery. He also observed that widespread ash and haze was trapped below an inversion layer at about 2 km altitude. On 20 March, a VAAC report at 1140 indicated a steam plume to 4 km but no visible eruption. Pilot Tait reported that at 1015 on 21 March the island was covered by weather clouds, the crater was not visible, and there was no vertical plume; haze was again below an inversion layer at 1.5 km altitude. No eruptions were seen during the 15 minutes the island was visible on the return flight around 1250. However, steaming continued, with the plume rising to 1.8 km altitude. A new eruptive episode was reported by Tongatapu airport observers at 1409 on 21 March that sent an ash plume 800 m high. Information Contacts: Steven Gates, Tradewind Island Sailing, Private Bag 63, Neiafu, Vava'u, Tonga (URL: http://www.manuoku.com/); Wellington Volcanic Ash Advisory Centre (VAAC), Meteorological Service of New Zealand Ltd (MetService), PO Box 722, Wellington, New Zealand (URL: http://www.metservice.com/ vaac/, http://vaac.metservice.com/); The Dominion Post (URL: http://dompost.co.nz/); Matongi Tonga Online, PO Box 958, Nuku'alofa, Tonga (URL: http://www.matangitonga.to/); Agence France Presse (AFP) (URL: http://www.afp.com/); The Boston Globe, Boston, MA, USA (URL: http://www.boston.com/). The eruption from Hunga Tonga-Hunga Ha'apai (figure 6) that began from multiple vents at Hunga Ha'apai island on 17 March 2009 ended after five days of activity on 21 March. The eruption destroyed all vegetation on the island, one of two high points on a submarine caldera rim (figure 7). Strong Surtseyan activity was witnessed by passengers on a fishing boat on 18 March (BGVN 34:02). Satellite imagery acquired that day (figure 8) revealed a bright eruption plume, an extensive 10-km-radius zone of discolored water around the islands, and pumice rafts that had already drifted 20-25 km towards the NW. By the next day, scientists on the scene observed that the submarine vent offshore to the S (figure 9) had built new land that was connected to Hunga Ha'apai (BGVN 34:02). Figure 6. Political map of Tonga, 1989, showing the Vava'u, Ha'apai, and Tongatapu island groups. Hunga Ha'apai is in the oval about 55 km NNW of Tongatapu Island. Map courtesy of the University of Texas Libraries, The University of Texas at Austin. Figure 7. Aerial photo showing the vegetated islands of Hunga Tonga (left) and Hunga Ha'apai (right) before the eruption. Courtesy of Brad Scott, GNS Science. Figure 8. Aqua MODIS satellite image showing the eruption plume drifting NE and pumice rafts from Hunga Ha'apai on 18 March 2009. Hunga Tonga and Hunga Ha'apai are covered by the bright steam plume and surrounded by discolored water caused by suspended sediments reaching a maximum of about 10 km from the island. A detached older plume, possibly ash-bearing, is to the NE. Serpentine-shaped pumice rafts are drifting in the NW sector at a distance of 20-25 km from the island. Contrast has been enhanced. Courtesy of NASA Earth Observatory. Figure 9. Aerial photo showing the island of Hunga Ha'apai with a steam plume rising from the vent in the newly created portion of the island. Emissions can also be seen in the vicinity of the small lake (left) marking the location of another vent active during this eruption. Discolored water surrounds the island, but a denser plume of material is originating from the shoreline near the small lake. View is looking SSE on an unknown date, March 2009. Courtesy of AusAID in Tonga. Based on inspection of an aerial photograph taken on 21 March (figure 10), the island had lengthened by ~ 1 km and the S crater was approximately 350 m in diameter on 21 March, assuming the island was 2 km long as previously described. Calculations using ASTER satellite imagery from 26 March result in similar dimensions for the island and S crater, and showed that the new extension was also about 1 km wide at that time. Figure 10. Aerial photo of the W side of Hunga Ha'apai island showing two steaming lakes in the NW vent area and a steam plume rising from the vent on the new southern part of the island. View is to the S on 21 March 2009. Courtesy of GP Orbassano and the Waterfront Lodge. Aerial photographs from 21 March showed no activity at the NW vent and a steam plume rising from the S vent. However, airport observers on Tongatapu saw new eruptive activity with ash plumes on the afternoon of 21 March (BGVN 34:02). A Matangi Tonga news article on 1 April reported the eruption as being on 17-21 March. Although Radio New Zealand International reported that residents of Nuku'alofa saw "glow on the horizon" on 22 March and stated that ash eruptions continued on the 23rd, those observations were not confirmed. On 27 March a group of four people, organized by Gian Piero Orbassano of the Waterfront Lodge, landed on Hunga Ha'apai using an inflatable dinghy launched from a charter fishing boat. They landed on the newly built southern part of the island and walked to the rim of the crater which they described as filled with orange steaming water. They noted that landing on the "rocky black pumice" shore was difficult in rough seas. Large boulders (sizes not given) on the surface crumbled when touched. The ground was firm to walk on, but the crater rim was "fragile and cracked" (figure 11). Orbassano, in a 5 April news report, stated that people were visiting the island by boat but not landing, viewing the "smoking" vents and yellowish water around the island. Figure 11. Photographs of the southern crater lake on newly formed land at Hunga Ha'apai, 27 March 2009. The steaming lake was colored orange-brown and the rim was unstable, as evidenced by the irregular rim, steep cliffs, and fractures. Courtesy of GP Orbassano and the Waterfront Lodge. Information Contacts: Brad Scott, GNS Science, Wairakei Research Centre, Private Bag 2000, Taupo 3352, New Zealand (URL: http://www.gns.cri.nz/); NASA Earth Observatory (URL: http://earthobservatory.nasa.gov/); GP Orbassano, Waterfront Lodge, Vuna Road, Ma'ufanga, PO Box 1001, Nuku'alofa, Tonga (URL: http://www.waterfront-lodge.com/); Radio New Zealand International, PO Box 123, Wellington, New Zealand (URL: http://www.rnzi.com/); Matongi Tonga Online, PO Box 958, Nuku'alofa, Tonga (URL: http://www.matangitonga.to/); Perry-Castañeda Library Map Collection, University of Texas Libraries, The University of Texas at Austin (URL: http://www.lib.utexas.edu/). The Global Volcanism Program has no synonyms or subfeatures listed for Hunga Tonga-Hunga Ha'apai. The small islands of Hunga Tonga and Hunga Ha'apai cap a large seamount located about 30 km SSE of Falcon Island. The two linear andesitic islands are about 2 km long and represent the western and northern remnants of the rim of a largely submarine caldera lying east and south of the islands. Hunga Tonga reaches an elevation of about 114 m above sea level, and both islands display inward-facing sea cliffs with lava and tephra layers dipping gently away from the submarine caldera. A rocky shoal 3.2 km SE of Hunga Ha'apai and 3 km south of Hunga Tonga marks a historically active vent. Several submarine eruptions have occurred at Hunga Tonga-Hunga Ha'apai since the first historical eruption in 1912. An eruption that began in mid-December 2014 built a new island between the other two large islands. Ewart A, Brothers R N, Mateen A, 1977. An outline of the geology and geochemistry, and the possible petrogenetic evolution of the volcanic rocks of the Tonga-Kermadec-New Zealand island arc. J. Volcanol. Geotherm. Res., 2: 205-250. Ewart A, Bryan W B, Gill J B, 1973. Mineralogy and geochemistry of the younger volcanic islands of Tonga, southwest Pacific. J Petr, 14: 429-465. Taylor P W, 1999. (pers. comm.). There is no Deformation History data available for Hunga Tonga-Hunga Ha'apai. The small islands of Hunga Tonga (upper right) and Hunga Ha'apai (left) cap a large seamount located about 30 km SSE of Falcon Island. The two linear andesitic islands are about 2 km long. They have inward-facing cliffs that represent the western and northern remnants of a the rim of a largely submarine caldera lying east and south of the islands. A rocky shoal is visible 3.2 km SE of Hunga Ha'apai and 3 km south of Hunga Tonga and marks the most prominent historically active vent. Aerial photo by Tonga Ministry of Lands, Survey, and Natural Resources, 1991 (published in Taylor and Ewart, 1997). There are no samples for Hunga Tonga-Hunga Ha'apai in the Smithsonian's NMNH Department of Mineral Sciences Rock and Ore collection. Large Eruptions of Hunga Tonga-Hunga Ha'apai Information about large Quaternary eruptions (VEI >= 4) is cataloged in the Large Magnitude Explosive Volcanic Eruptions (LaMEVE) database of the Volcano Global Risk Identification and Analysis Project (VOGRIPA).